Throughout the year, looking out from the Oregon coast, you can often spot gray whales with the naked eye. Behind the magic and mystery of these massive creatures are teams of researchers tracking their migration and studying their diet. Lisa Hildebrand is a 1st year Master’s student in Wildlife Science working with Dr. Leigh Torres within the College of Agriculture. 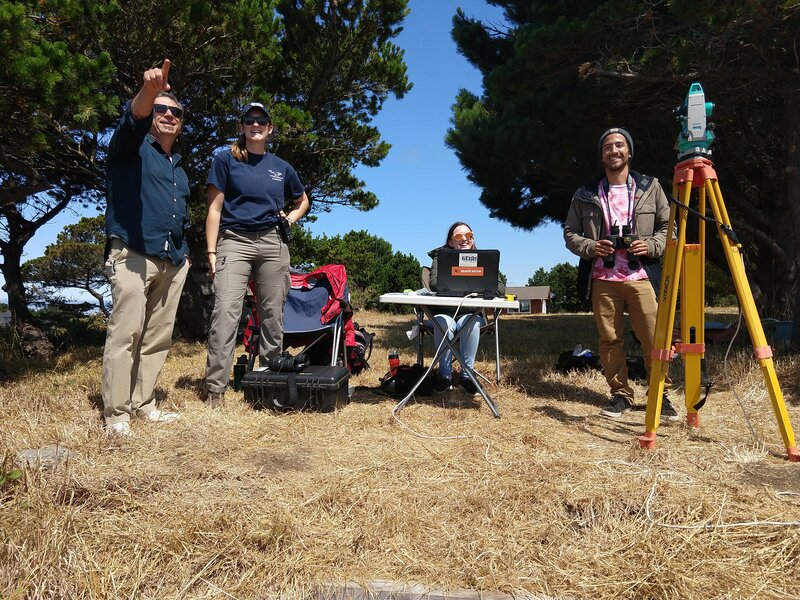 Lisa studies geospatial ecology of marine megafauna, meaning that her research focuses on the feeding and movement through time and space of sea creatures larger than most fish, including large sea birds, seals, dolphins, and of course, the gray whales. To study such large animals in the ocean, Lisa manages a team that combines diverse technologies coupled with fine scale foraging ecology. Gray whales feed on very small zooplankton suspended in shallow water. The whales don’t have teeth but instead have rows of baleen which look like a thick brush and act as a filter for water and sediment while letting in large quantities of zooplankton. In July and August, Lisa and her team of 4-5 people go out to Port Orford, Oregon. The team splits into two groups: a cliff team and a kayak team. From a cliff above their 1km2 sampling site, theodolites and computational programs are used to track whales by height and GPS location. 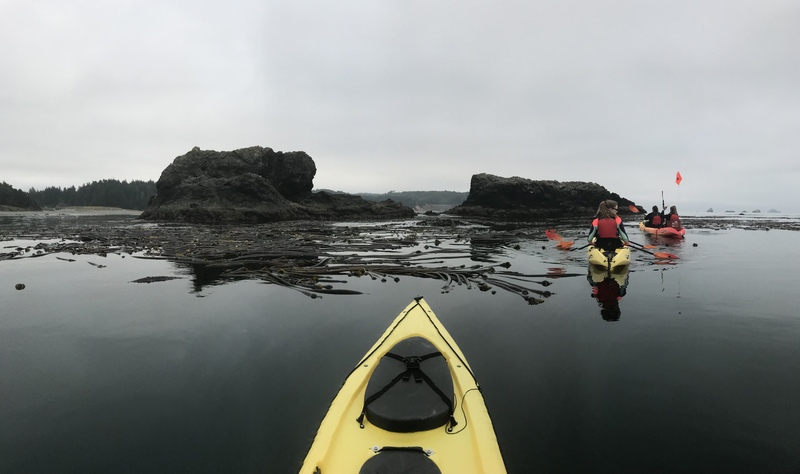 Once a whale is spotted, team members kayak to this location and take water samples for analysis of zooplankton density, caloric content, species, and microplastic quantity. Lisa has taken over this ongoing project from a previous Master’s student, Florence Sullivan, and has data on the same research site and whales going back to 2015. This research project provides opportunities for both undergraduates and high school level students to obtain first-hand field research experience. The students involved are able to take what they’ve heard in a classroom and apply it outdoors. 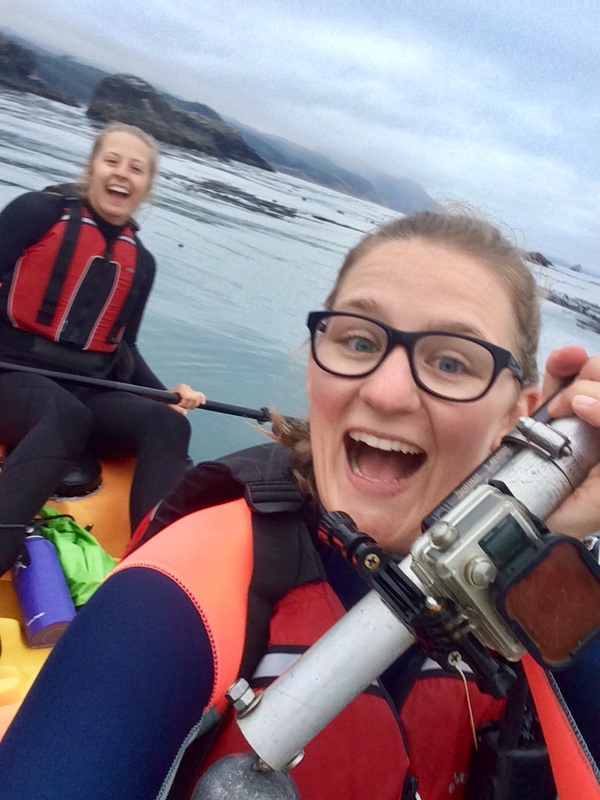 In particular, Lisa is passionate about getting the students in the local Oregon coastal community involved in research on the whales that bring many tourists to their area. 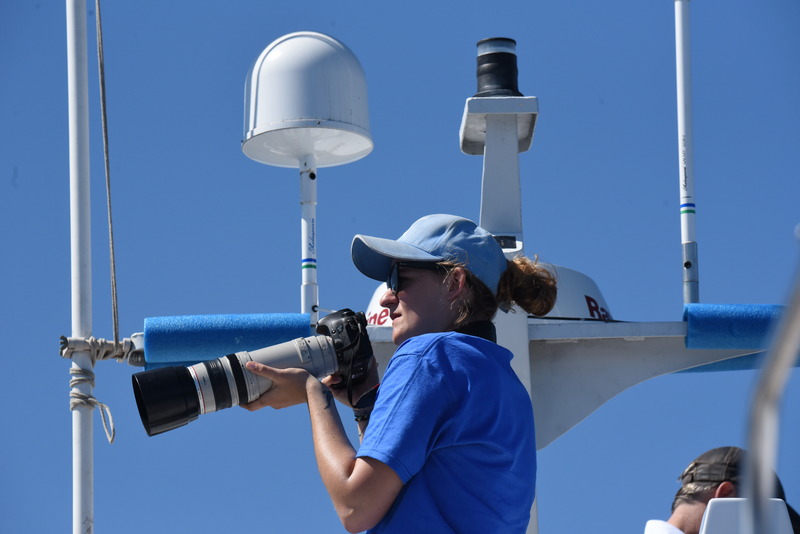 To study the large gray whales, Lisa spends most of her time studying the small zooplankton that they eat. Zooplankton hide under kelp and it turns out, can be separated by populations that are pregnant, or varied in age or species. Gray whales may show preference for some feeding sites and/or types of zooplankton. Why do we care what a gray whale’s dietary preferences are? Plastic use and plastic pollution are rampant. Much of our plastic ends up in the oceans and photodegrade into microplastics small enough to be consumed by zooplankton. Since gray whales are the top predator for zooplankton and eat large qualities, these microplastics accumulate. Microplastic presence may differ between regions and species of zooplankton, which may relate back to whale preferences and migratory patterns. On the Oregon coastline, microplastic profiles of zooplankton have not yet been studied. As humans are also consuming large quantities of seafood, it is important to understand how microplastics are accumulating in these areas. Lisa is from Germany and grew up in Vietnam and Singapore, but she was first inspired to pursue marine animal research as a career after a family trip to Svalbard, Norway during high school. Before obtaining her undergraduate degree in Marine Zoology from Newcastle University in England, Lisa took two years off from schooling and completed two internships: one with bottlenose dolphin sanctuary research institute in Italy and Spain, and one at a seal research facility in Germany. Now that she’s settled in Oregon for now, Lisa is enjoying the nature and in her free time loves hiking and skiing. To hear more about Lisa’s research, tune in Sunday, January 20th at 7 PM on KBVR 88.7 FM, live stream the show at http://www.orangemedianetwork.com/kbvr_fm/, or download our podcast on iTunes! This entry was posted in College of Agricultural Sciences, Fisheries and Wildlife, Marine Ecology on 2019-01-20 by Heather Forsythe.